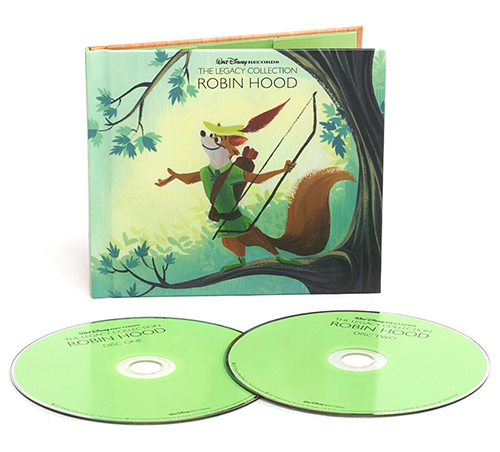 The book’s essays cover, among other topics, the folklore of the Robin Hood hero, how the Disney company settled on adapting it for its own vision and the backstory of bringing it onto the big screen. Profiles of the voice actors and the process of selecting them for the film are included. (Brian Bedford, for example, was chosen for his “smooth” and “sophisticated” delivery to give voice to the title character.) Lyrics for the songs, the personnel of the music's orchestra are also duly noted. There are also a few pages of pre-production art that I don’t believe has been shared by Disney before. One particularly charming drawing of note depicts our hero romantically engaging Maid Marion as she sits on a swing. The audio quality presented on this edition is a mix that is crisp and clear, if not as fully dynamic as one would hope, but understandable considering the source material resulting from the recording technologies of the time. All the familiar tracks sung by and about the characters are contained here, including the Academy-award nominated “Love” (which, in an error in the liner notes, is replaced by “Oo-De-Lally” as the song that appears in The Fantastic Mr. Fox). The majority of the tracks consist of composer George Bruns’ instrumental music that, even without the accompanying dialog, will be instantly familiar with any fan who has seen the film over a dozen times or more. Perhaps my only request for this presentation would to have brief interjections of choice dialog from the major characters placed thoughtfully throughout, as the film's voice-acting is exceptionally splendid from all involved. The first disc runs over an hour’s worth of material. The bonus disc is where fans will want to immediately dive into, as it contains alternative versions of some key tracks including a ragtime-style version of “Whistle Stop” that is pure delight. Another notable selection is an alternate version of “Love” as sung by the character of Robin Hood himself (in this instance singer Pete Renoudet takes on vocal duties from Bedford). A particularly head-scratching addition in the bonus disc material are a series of songs performed by the character of The Jungle Book’s King Louie (as voiced by Louis Prima) that reimagines the orangutan and our outlaw fox sharing the same universe and being the best of friends! Perhaps Disney was foreseeing the possibility of a “shared universe” that has become so prevalent today among modern-day superhero and action films? This second disc runs at just under a half-hour’s worth of music. I’ve covered only a fraction of what to expect when experiencing this fine collection, and there are still many intriguing pieces of information found inside that I haven’t spoiled yet. I would encourage you to consider purchase of the physical CD for the handsome packaging, but I see that iTunes also has the album to purchase digitally with an accompanying “booklet” that likely includes all the content from the physical release. A 10 out of 10 score from me! If the Disney company will be continuing this thing, I am all in support. But I also want full soundtracks to MY favourite films, which include Rescuers and some less notable ones. I hope those are released also. And I hope these are "remastered" properly. All too often the volume is amplified for no reason other than "but louder is better!" Considering Disney has rolled out deluxe treatments of The Aristocats and Robin Hood I don't think expecting a similar release for The Resucers is unreasonable. I predict a possible bundling of it with its 1990 sequel together. What makes me wonder about some movies is that do they have music to warrant two discs worth of material (ie, Fox and the Hound)? As you can see above there are still "big" titles yet to be added (Bambi, Dumbo, The Jungle Book, The Hunchback of Norte Dame, Lilo and Stitch, etc.) and then thrown in the Pixar films and we see there is a lot of music to get to. I will never consider Toy Story to be "a Disney film", not matter how hard the house of mouse tries to make me. Love was in fantastic mr. fox! It's played very quietly in the background during the scene where Ash and Kristofferson are diving into the pool. The article agrees with you, he's saying that the notes claimed "Ooo-da-laleh" was in Fantastic Mr Fox instead of Love. Maybe it's just me but everything about the packaging and the minimalist, pale green look of the discs screams 70's which is probably what they were going for. According to David Koenig's book "Mouse Under Glass", Louis Prima was so upset over not getting a role in "Robin Hood", that he personally paid the recording expenses for the subsequent album, Let's "Hear" it For Robin Hood, which he sold to Disneyland Records. That's where that King Louie/Robin Hood song came from. The liner notes do mention the origins of the album, but (being Disney) omits the motives for Prima's recording or that it was self-financed. Well this has jumped to #1/2 on my Wish List. Fantastic Mr. Fox Criterion is still up there, but I want them both equally.